Regular contemporary life is quite hectic, and the mind, body, and spirit go through various spins just trying to keep up. While we’re running amuck, tending to chores, and fulfilling our duties, we have a tendency to fall out of sync with ourselves, which eventually results in a deterioration of our health and well-being. The truth is that we all need a support system in the form of something that can help us keep running and remain healthy even on our busiest days. Yoga has been helping people for centuries to achieve complete balance in the body, mind, and spirit. The science of yoga is universal and does not require a specific time, place, or schedule in order for practitioners to benefit. You can make it your most reliable companion, even on the busiest of days. All yoga needs is the right mindset. Here are five ways you can incorporate yoga into your hectic schedule and achieve greater balance, harmony, and wellness. If you snooze in the morning, then you shall lose the day! True to these words, yoga demands commitment, but in return, it will be your constant supporter, even through your worst days. The first step to incorporating yoga into a busy lifestyle is adjusting your body clock so that it is in line with the daily cycle. As a yogi, it is essential to function in harmony with the energy cycle of the sun. This means getting 6-8 hours of sleep, along with ensuring that the wake-up time is at or before the sunrise. Turn off the lights and put away your electronics by 11pm, so you can wake up feeling fresh and active just before the sun begins to shine its first rays. Begin your day with 10 minutes of Sun Salutations, which can have the same effect as a 45-minute workout. Through Surya Namaskar, you not only pay homage to the ultimate source of power (the Sun) but also start your day off prioritizing your mind, body, and spirit. Breath is the source of life. Yoga explains how breath is directly linked to the health and wellness of the entire body and mind – this pranayama breathing technique can be performed anytime and anywhere. All you have to do is breathe into the full capacity of the lungs, retain the breath for a few seconds, and gently breathe out through the nostrils. This is recognized as Simple Relaxation Yoga Breathing. This process of breathwork not only clears any channel blockages in the body and mind, but also ensures that impurities are flushed out from the body in the form of carbon dioxide. If you want to kick it up a notch, there are a few other yogic breathing techniques that you can try, such as Alternate Nostril Breathing, Sudarshan Kriya, Sheetali Breath, or Kapalbhati. Ayurveda, the sister science of yoga, has a significant role to play in sustaining a yogic lifestyle. Our body is composed of different doshas (constitutions) that directly influence our physical and mental behavioral patterns. Maintaining a dietary discipline according to the body constitution is crucial for gaining the maximum results from your yoga practice. If you are unsure about your dosha, then seek the help of an Ayurveda expert, and begin to incorporate the suggested personalized diet that they will recommend. If you’re too busy to roll out the yoga mat and perform a full routine, this doesn’t mean you can’t practice yoga! If you are devoted and in need, then the science shall accompany you wherever you go. Take a few minutes in the car, at work, at your desk, or in the kitchen to practice some Chair Yoga. Try the Seated Spinal Twist, Cat/Cow Pose, Seated Camel Pose, Seated Forward Bend, Seated Tree Pose, or any other poses that you can perform comfortably and in the space of a few minutes. These poses are simple, restorative, and highly effective in keeping the circulation of energy up and running through the entire body from head to toe. Now that you are all set to doze off, invest in a few minutes of guided meditation and self-reflection. This can be done by lying down in a supine position, and gently reminiscing about the gifts of life with gratitude while embracing any disparity with positivity. This will help you sleep better, as the practice puts both the mind and the body in a peaceful state. The first step to welcoming yoga into your life is a resolution. The rest will follow. 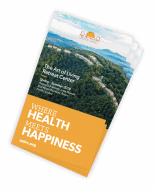 Interested in learning more about yoga and the programs at the Art of Living Retreat Center? Check out our annual catalog here!